Illinois' 89th State House District issued the following announcement on March 15. As a freshman legislator in Springfield, I am experiencing a lot of “firsts”. The past few weeks have been the first state budgeting process I have been through. As a freshman, you go into this process with a lot of high hopes. I can sincerely say that was my spirit in the leadup to Governor Pritzker’s First Budget Address a few weeks ago. Perhaps some would call it naïve, but I try to be optimistic, nonetheless. 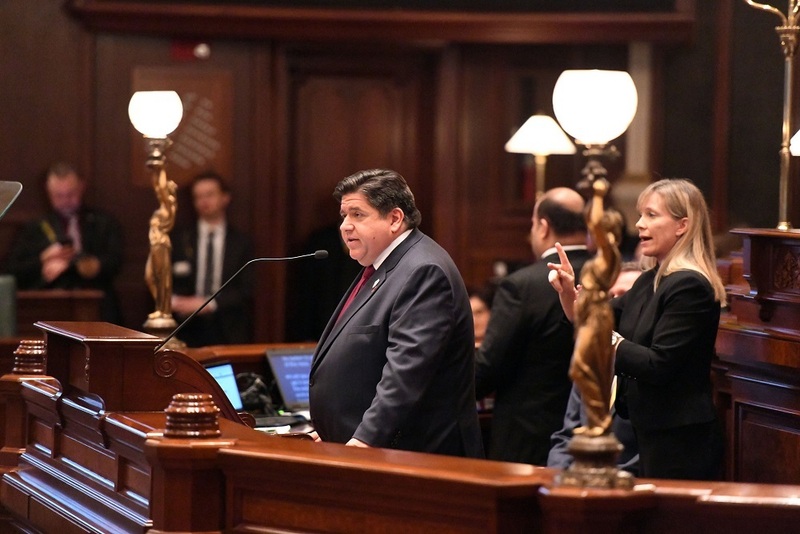 As this was Governor Pritzker’s first budget address, as well, I’m certain he also went in with a lot of high hopes and optimism. My enthusiasm, unfortunately, soon turned more toward pragmatism over some of the budget proposals made by the new Governor in his first budget address. Many of his proposals were revenue-based and the speech was painfully short on reform-based proposals. Enthusiasm faded as a spending-intensive plan was elucidated by Governor Pritzker. If one had little background in Illinois’ finances, they may come away with the impression that the only problem that has plagued Illinois, which the Governor earnestly proposed to “fix”, is that the State has simply not brought in enough revenue. However, when one understands that “revenue” means “taxes”, reality does not meet the perception. Indeed, we’ve observed this song and dance from Chicago democrats many times before in Illinois. We do not have to look that far back into our history (1969-1982) to remember Illinois Personal Income Tax Rate was 2.5%, nearly half our current 4.95% rate. Despite that nearly doubling of the rate in many of our lifetimes, Governor Pritzker leads us to believe we have a revenue problem and not a spending problem. What a surprise this must seem to those who remember the 2.5% rate. Certainly, the roads and bridges must have been worse, schoolhouses must have been crumbling, and the social service safety nets must have been nonexistent under those rates. However, we all know that the conditions have worsened since the rates have increased and not the other way around. Now that we do have those higher income taxes (as well as a bevy of other, higher taxes- property taxes, sales taxes, and darn near every other type of tax), we are to believe that it’s still not enough money to fix the problems? The net impact of taxes on Illinoisans is crippling, especially when compared to our Midwestern neighbors. Increasing taxes further without addressing major cost-drivers like Medicaid and Pensions will only serve to accelerate the expatriation of Illinois families. When residents lose hope that we can right the ship, they leave for greener pastures. Indeed, the Illinois exodus indicates they believe just that. These issues are being spun feverishly as attempting to make the “rich pay their fair share”, pinning the argument on an “us versus them” tripe that has helped expatriate massive wealth and countless job creators across our borders. With one of the highest net tax burdens in the country, we should be laser focused on growing our economy, making things better for entrepreneurs to start and stay here and considering opportunity equivalent to resident retention. I believe, firmly, that both parties want to help working families in our State. The differences, however, in how to do so are largely illustrated in the debate we will see play out this Spring. One group believes the way to do that is through increased accountability and reductions in spending and the other believes growth can be mandated by government through required giveaways paid by higher taxes. This isn’t the “first” time we’ve seen these proposals and, yet, here we are with a higher tax burden and nothing to show for it today. Why would any of us think that doing the same thing will yield different results this time? Want to get notified whenever we write about Illinois State House District 89 ? Next time we write about Illinois State House District 89, we'll email you a link to the story. You may edit your settings or unsubscribe at any time.